The River. Our Boy. His Pop & Nana. We took a drive over to the river to enjoy the view. Love this picture of Pop and Griffin. It's so sweet the way Pop's hand is on Griffin's head and Griffin is holding on to Pop's leg. We are all under the weather here at our house. Seems to have caught all of us (except for Nana) at the same time. We are trying to feel better because we want to enjoy our time together. I've said it before ... and I will say it again ... the simple things in life bring us the most joy. Take for instance our yesterday. Pop and Nana arrived and all it took to bring great happiness to my little boy's life was his Pop, his Nana and a waterhose. Nana chasing Griffin down with the waterhose. The picture may be a little blurry ... but the happiness on Griffin's face is loud and clear. A little swinging time with Pop does a boy good! We drove down to the farm and visited the goats. Elizabeth introduced us to a baby turkey. He may be ugly ... but he sure was cute! We are so blessed to have Pop and Nana visting. We are having such fun! A Special Day Has Arrived. We have been marking the days off on our calendar until today! Our calendar is taped to the refrigerator. At first I would mark the days off with a big pink X to show Griffin how many more days it would be. Then I decided Griffin might enjoy doing it. Each morning he's been pulling a bar stool over to the calendar and putting his very own X in the box to mark off the day. He's enjoyed doing this so much! Today Pop and Nana will arrive in town ... we can't wait!! Taking a little break ... will be back on Monday. Field Day Of The Past. Saturday we had a full day of fun! First up was Griffin's first soccer game of the year. Then we went to Field Day of the Past. It's a local event that includes tractors, animals, crafts, a carnival and such. Griffin loves tractors and he enjoyed getting on the big digger. Luck Stone had an exhibit where the kids could take a big rock, put it in the crusher and it then became gravel. Love how hands on everything is! Had to take a picture of this antique postal car. All over the property there are old houses, stores, a post office, a church ... etc. A big draw for us was the tractor pulls! And the carnival rides of course! Mike and I are convinced this is the very same motorcycle ride we rode as kids ... lol. Look ... up in the sky ... it's Mike and Griffin riding the ferris wheel. They are way up top in the purple cart. The boys rode the big slide together. After this Griffin rode it a couple of times by himself. He climbed all the way to the top with his carpet all by himself! It was such a fun day ... can't wait until next year. Yesterday was early release day for our local school system, so we were lucky enough to be able to spend some time with Keisha and Darius. We met for lunch at the mall and the boys enjoyed playing together in the play area. It was fun catching up with Keisha and enjoying some time with my wonderful friend. Sunday was a day of celebration! Griffin's friend Phelan celebrated his 3rd birthday ... at where else? Kangaroo Jack's! Phelan's mother Sybil had the cake made by a friend of hers. It was soooo cute! It was a blue dinosaur with cupcake "boulders" surrounding it. The very sweet 3-year-old birthday boy! Two of the cute party goers jumping in the house ... Griffin and his friend Patrick. Thank you Sybil, Greg, Phelan and Luca for a GREAT time! I love the colors ... they are so warm and inviting. Seems like when fall comes around I am once again inspired to create. Now that Griffin is back in school I will have time to do that. I thought I would share a few of the fall inspired paper piecings I currently have in MY EBAY STORE. You can find them by CLICKING HERE to enter my Ebay Store. Another fun thing I would like to tell you about ... I've reopened my Etsy shop. I know some of you prefer Etsy to Ebay ... so now if you are interested you can shop with me on Etsy too! CLICK HERE to enter my Etsy shop and make sure to bookmark me!! My Missy Made It! Facebook Page. It's such a fun way for me to communicate with those that enjoy my Missy Made It! paper piecings. I offer discounts to my Facebook Friends and EVERY Friday I have a give-a-way! So if interested CLICK HERE to become a Facebook Friend. I'm burning with creativity today ... can't wait to be able to get my hands on the paper, glue and punches a little later. Wow ... what a wonderful birthday! We celebrated all weekend long. Saturday night we enjoyed a night out at our favorite Virginia BBQ restaurant, Famous Daves. Not only were we celebrating my birthday, we were also celebrating Mike's achievement of getting his private pilot's license! Sunday night Mike cooked my birthday dinner. I have to say he is a grill master and he prepared the BEST steak I've ever eaten. He grilled us a ribeye and we served it with grilled onions, sweet potato and green beans with garlic. Yum!! Oh yeah ... I can't forget his famous dill sauce ... DELICIOUS! The boys made me the best birthday cake ever! It's chocolate fudge cake with whipped milk chocolate icing. It's just what I wanted and the boys were sweet enough to make it for me. Look closely at the birthday cake ... I told Mike you can definitely tell an engineer iced it. Me? I slap the icing on the cake any way I can. He took the time to make it all nice and pretty. Last night after dinner it was time to blow out the candles, but we were out. The only candle we could find is the one from our 30th birthday party ... so we used it. Mike gave me the BEST gift last night ... he made me 12 years younger, if only for a second. Thank you Mike, Griffin and my family and friends for making this the BEST birthday ever. Self portrait of a 42 year old. Yep ... I'm 42 today. Mike ... Our Private Pilot. Mike had his final check ride with an FAA examiner yesterday. He has OFFICIALLY earned his private pilot license! We are very, very proud of him!! 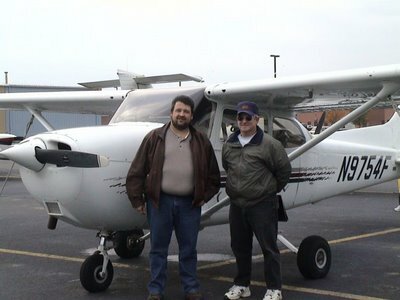 This is a picture of Mike taken with his flight instructor back in October 2006. This was the day of his first solo flight. Wow ... what an achievement. We are soooooo proud of you sweetheart! Handmade John Deere Pillow & Bag! Griffin received a surprise package in the mail from our wonderful friend Terri. She made him this handmade John Deere pillow case ... she even embroidered his name on it! He thought that was "Way Cool, Mom"! And ... she sent him this John Deere bag. If you have any question about whether he liked these wonderful gifts or not ... well, just look at the bag. Two seconds after he got his hands on it he filled it with his beloved tractors. Terri ... thank you SO very much for thinking of Griffin. He truly loves the things you made for him. It made our little guy feel extra special!